Our top of the line hand wash service. The interior detail package cleans every nook and cranny of your vehicle's interior and washing the exterior. 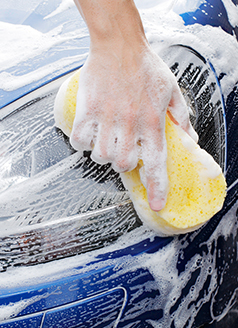 Exterior details service washes, waxes, and revitalizes your vehicles for long lasting protection and shine. This package cleans every nook and cranny of your vehicle's interior and washes, waxes and revitalizes the exterior for long lasting protection and shine. The Ultimate Auto Spa is our top of the line detailing package that will make your car sparkle inside and out! Will remove oxidation and discoloration which diminishes the head lights ability to project light which greatly reduces nighttime effectiveness.